Let cookie dough stand at room temperature 10 minutes to soften. In 1-quart saucepan, mix blueberry preserves and blueberries. Cook over medium heat, stirring occasionally, until thoroughly heated. Set aside; keep warm. In small bowl, beat 1/2 cup of the cream with electric mixer on medium-high speed 1 to 2 minutes or until stiff peaks form; refrigerate. In large bowl, break up cookie dough; add eggs and lemon peel. Beat with electric mixer on medium speed 1 minute or until smooth. Beat in remaining 1/2 cup of the cream and 3 tablespoons water until smooth; stir in nuts. Pour 1/3 cup batter onto each waffle section. (Check manufacturer’s directions for recommended amount of batter.) Close lid of waffle maker. Cook 4 to 6 minutes or until waffles are golden brown. Carefully remove waffles to heatproof plate; keep warm in oven. Repeat with remaining batter. 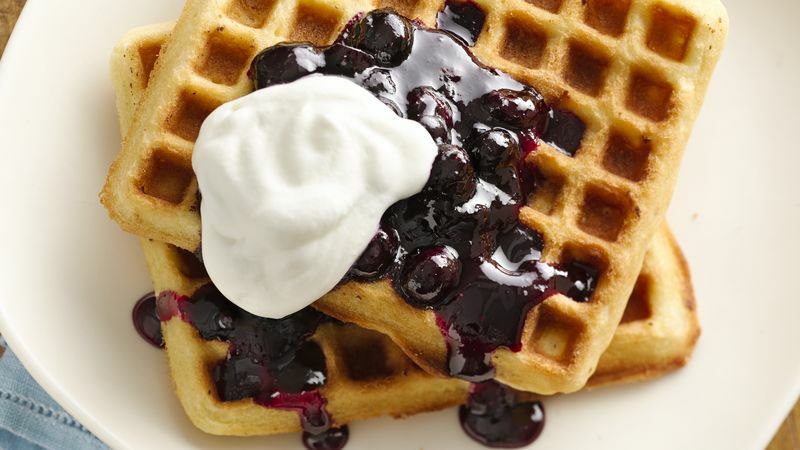 To serve, top each waffle with blueberry mixture and whipped cream.